I took this shot while visiting Wroclaw in Poland for the first time. 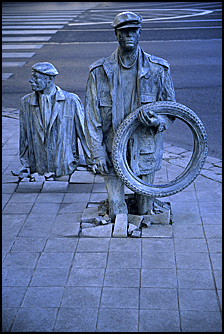 It is part of a group of statues called Anonymous Pedestrians by artist Jerzy Kalina. The “pedestrians” are depicted sinking into the pavement one side of the road and emerging from the other. This picture shows just two of the characters in the emerging group. I was told that the work represents the people who were forced to go ‘underground’ when martial law was introduced in December 1981. After studying photography at Blackpool College Martin Cameron moved to London in 1983. After two years’ assisting he secured a ‘proper’ job shooting for Readers Digest before striking out on his own in 1986. Martin was studio-based in London for 15 years during which time he studied Law “to learn how to prevent getting ripped off”. He was subsequently invited to join the AOP to put his legal knowledge to good use advising on copyright and contract issues. Martin started shooting full-time again in 2007. He is based in Grantham and shoots predominantly for book publishing and stock. Photographer since 1985, EPUK member since 2005.